You will receive an SMS with a link to download the App. Everything you need, to plan your dream Wedding! Search for vendors, ideas, real wedding stories and more! India&apos;s favourite wedding planning platform. Our booking feature lets you plan stress-free! Instantly price & book your vendors online, enjoy multiple benefits & be a Bridechilla! 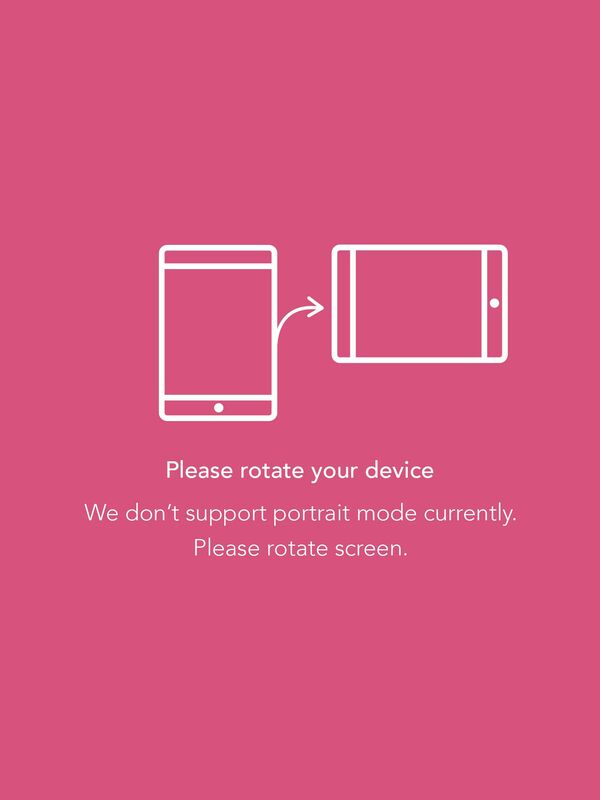 We don't support landscape mode currently. Anameha Infomedia Private Limited ("WedMeGood" or "we") is a wedding portal and directory. Our mission is to provide online platform or market place that provides valuable wedding-related information for the modern prospective couple. The services offered by us include the WedMeGood websites located at wedmegood.com or any sub domain of wedmegood.com (the "WedMeGood Website"), and any other feature, content or applications offered from time to time by WedMeGood in connection with the WedMeGood Website whether accessed directly or through our application for mobile devices (collectively, the "WedMeGood Services"). Thanks for using Wedmegood.com, other Wedmegood services and apps! This Agreement defines the terms and conditions under which you are allowed to use the Website or Wedmegood App (application) and describes the manner in which we shall treat your account while you are registered as a member with us. If you have any questions about any part of the Agreement, feel free to contact us at wedmegood.com. We reserve the right to modify or terminate any portion of the Agreement for any reason and at any time, and such modifications may be informed to you in writing. You should read the Agreement at regular intervals. Your use of the Website or application following any such modification constitutes your agreement to follow and be bound by the Agreement so modified. This Agreement supersedes all previous oral and written terms and conditions (if any) communicated to you relating to your use of the Website or application to avail the Services. By availing any Service, you signify your acceptance of the terms of this Agreement. If you do not agree to be bound by the terms of this agreement, please immediately terminate the usage of the application. Your usage of the application shall be assumed as deemed acceptance of the agreement of these terms and conditions. If you wish to become a vendor, submit content, video or images, communicate with other Users and generally make use of the WedMeGood Services, you must read this Agreement and indicate your acceptance during the content submission process. The Agreement is published in compliance of, and is governed by the provisions of Indian law, including but not limited to: the (Indian) Information Technology Act, 2000. Your access to use of the Website and the Services will be solely at the discretion of wedmegood.com. So please take a few minutes to read over the vendors Agreement below. 2) A representative of WedMeGood creating a profile on vendors’ or brand’s behalf, with oral or written consent of the same. In such a case, images would be uploaded by the vendor themselves/ mailed to the representative/ collected from other domains by the company representative with the vendors’ consent. 3) In case a user has written a review about the vendors’ service experience. In such a case, a shell or unclaimed profile is created to showcase that review of the brand in question. In future, at the vendors discretion, this shell account can be converted into a full fledged listing. The review and information policies are covered in other parts of this agreement. We recommend you not to share your account password, or let anyone else access your account, or do anything else that might jeopardize the security of your account. You will be responsible for preserving the confidentiality of your password and for all actions of persons accessing any of our sites through any password assigned to you. You will notify us at wedmegood.com of any known or suspected unauthorized use of your account. You must have obtained all necessary internal as well as governmental and statutory licenses and approvals necessary for the execution of this Agreement and the conduct of its business. There are no pending or threatened legal proceedings against you before any judicial or quasi-judicial forum whatsoever and further that there are no existing or proposed contracts and/or agreements that may affect its performance hereunder; and it shall comply with all applicable laws in the performance of its obligations hereunder. By registering as a vendor on WedMeGood, you can receive news, updates & promotional communication via SMS & Email. If post registration/ your profile being created, you wish to dissociate from the profile in any way, your profile will shift into an “unclaimed” category to showcase any user reviews that might have accumulated for your business. From time to time, Wedmegood runs giveaways and organizes contests for the third party. Each contest or giveaway will have its own terms and conditions which shall be published or made available along with the other details regarding the contest, if the vendor takes part in, agrees to, or engages, or registers itself in any such contest then WedMeGood encourages you to review such terms and conditions prior to engaging with each contest or giveaway. Once having accepted the terms and conditions of the contests and giveaways the vendor shall be bound by such terms and conditions. In case wedmegood undertakes a project including but not limited to campaigns or shoots in capacity of being a customer or the person commissioning the project for a third party and requires the vendor to be an integral part of the project, such an agreement between wedmegood and vendor shall be of the nature of collaboration hence the copyright will be held jointly by wedmegood and the vendor. In furtherance to this clause, the vendor is curtailed to use such images or videos on any other wedding platform. However vendor is free to use these images or videos on their personnel websites/ social media. Removal or editing rights for such images and videos shall be retained by wedmegood exclusively and they cannot be removed without the prior permission of wedmegood. In case the vendor finds any review offensive or they dispute a review on any of the material uploaded by them and they want to get it removed, then in such a case the vendor or the user is free to send a request to vendors@wedmegood.com and include a brief description of the review(s) to be removed along with the current location of such review on the WedMeGood Website and the reason(s) for such removal. We shall investigate into the matter to ensure the validity and authenticity of such request, investigation will be based on certain internal parameters. If it’s found genuine and relevant then the related review will be hidden or removed. Upon the vendor being selected for the handpicked and features section they must keep in mind that these sections are incorporated by wedmegood for better and improved user experience, it also helps with the promotion of vendors but wedmegood does not guarantee leads generated by the vendors while they are a part of the handpicked and featured section. A real Wedding upload to, submit to, or embed on any WedMeGood platform by the bride or groom suo moto or by their family member authorized to do so, then such a wedding will be removed or deleted from the Wedmegood platform only with the prior permission/consent of the bride, groom or by the family member so authorized. This clause applies to an entire wedding, an image or a video uploaded to, submitted to, or embedded on any Wedmegood platform. Weddings you upload to, submit to, or embed on any WedMeGood platform can be used by Wedmegood for mutual promotion on any digital and offline mediums. However, wedmegood does not claim any ownership right for the same. In case the vendor wants to get the wedding submitted by him removed, then in such a case he is free to send a request to info@wedmegood.com and include a brief description of the wedding to be removed along with the reasons for such removal. We shall investigate into the matter to ensure the validity and authenticity of such request. Investigation will be based on certain internal parameters. If it’s found genuine and relevant then the related wedding can be hidden or removed. All reviews form a part of the user content on the wedmegood platform and are the sole property of wedmegood, thereby authorizing wedmegood to retain such reviews along with the images or videos or any material so reviewed. In case the original images are requested to be removed by the vendor or in case the vendor removes their wedmegood account and whether finally agreed or decided elsewise the reviews to the related content retained in the shell account shall continue to be wedmegood’s property. For the publically available information put up on other platforms including but not limited to name and phone numbers may be retained by wedmegood in any case whatsoever. Once a premium subscription is purchased & activated, the same cannot be cancelled. Subscription payment made to WedMeGood for any premium membership is non-refundable. Glad to have you on board! All that's left to do now is to verify your account using the link that has been emailed to you.